Outline is an intuitive note-taking application for OS X with convenient structure resembling real paper books: notebooks, sections, groups of sections and pages help to keep order in notes, regardless of their complexity. Outline for Mac is perfect for students, teachers, physicians, lawyers, executives and everyone who’s daily life involves extensive note-taking of any kind. 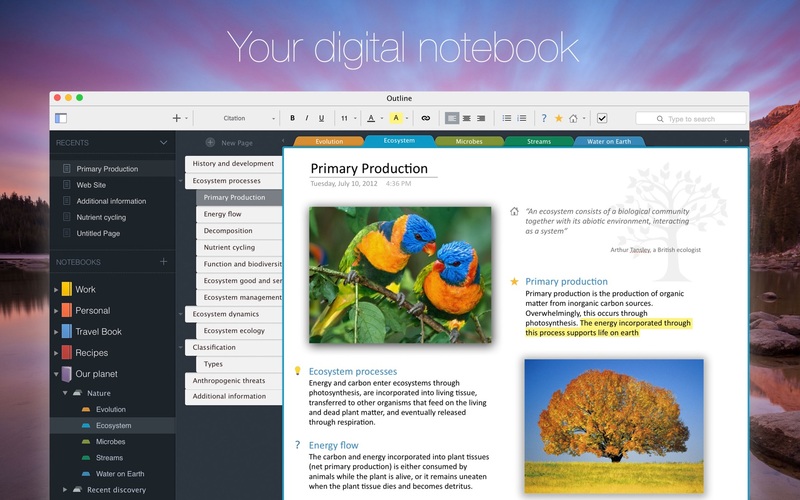 It can be coupled with Outline for iPad and Microsoft OneNote, which makes notes multi-platform. Word Counter Pro 1.7.2 – View writing statistics. Nisus Writer Pro 2.1.9 – Multilingual word processor with indexing. Fade In 3.0.576 – Professional screenwriting software.